To recycle a piece of passing rhetoric of recent vintage, a “teaching moment” has arrived for parents of abducted children. The cause we fight for crosses paths this month with another element of the latest monstrous, attention-compelling calamity that is the Trump presidency: caged children in Concentration Camps, and suicidal, incarcerated parents. And now, it is emerging, drugged children. What we have before us is both a jarring indication of moral and ethical death, and a spectacle we cannot ignore. As preface, it is correct to observe that the current savage treatment of families of migrants is not an isolated phenomenon, unique to this White House. This forms a part of what we eventually should and will specify, speaking as parents of U.S.-Japan child abductees. First, let’s note that the cyborgs who speak for the Trump White House make the case that they can meld their responsibility for the ruin of additional lives into the more direct and violent methods they have selected, and justify the degeneracy of ICE’s actions by the thinnest of moral subterfuges. For Sarah Huckabee Sanders, it is “biblical” to enforce the law, she says, making the maximization of cruelty to children and parents into an act of religious piety. It is also a matter, they say, of the content and intention of the sanctity of the written law; a justification for these acts of violence as the exclusive claim of the State, and thus inherently moral. This fusion of religious dimension and State dominance is not a new guise for cruelty to children; but then, Torquemada has been dead for some centuries and is seldom cited as an example for us to follow today. U.S. Immigration and Customs Enforcement (ICE) director Thomas Homan rejected comparisons of his federal agency to that of Hitler’s Nazi regime earlier this week by saying that they are just following orders. Homan seemed to be unaware that he used the same “just following orders” defence that was used by Nazis during the Nuremberg trials following WWII. This is according to reporting in Newsweek and FoxNews. They’re following orders; but no, they’re not Nazis. Attorney General Jeff Sessions also appeared on Fox News where he was asked to comment on the same comparison. Sessions highlighted that Trump’s administration was not keeping immigrants from leaving the U.S., unlike Hitler’s regime, which detained Jews in concentration camps. Let’s all say thank you for that clarification to Mr. Jeff Sessions. The pathologization of migrants, who in this instance are victims of military coups supported by the United States, collateral of violent unpoliceable drug wars, and product of the substantial extension of danger and poverty via finance capital expropriation of land, has been in full swing for decades, alongside the similar pathologization/incarceration of Black Americans, portrayed on Fox and in press briefings as a justified outgrowth of the victims’ “irresponsibility” The officials and their public and media supporters parrot one another, and so the story goes: the migrants know that the help they desperately seek is sanctioned by a law concerning their citizenship, from which they are excluded; and they are therefore eligible for punishment, incarceration, separation, and repatriation. The thinning, erosion, and disappearance of security for this vulnerable population perennially comes to fruition under the guise of the dissolution of territorial sovereignty – a product of the extension of corporate sovereignty into the territory in which they were previously housed, which is simultaneously historically recognized as sovereign under the law of the respective states. (But which law takes primacy, whose and where, is a political matter.) We thus have a repetition of the withdrawal of state/ citizenship protection from a large population of ordinary people who can then be disposed of in whatever fashion the still-sovereign territorial states see fit. Still uncertain about the comparison to the incremental methods of Nazism? Precarious life, it has been driven home, is the rule, not the exception. It is no longer necessary for neoliberal, or Western, or industrial (or all three) states to outsource this phenomenon. We live here as everywhere with the nightmare of contingency and insecurity. The “zone of precarity” is thus broadened beyond liberal notions of rampant inequality. This should not come as news to the parents of children on whom the United States and its partners have been turning their backs for decades. There are elements of this issue that remain very delicate. We, parents of the abducted, have had a sense among many of us that we had origins in a privileged zone in the United States, yet we have had to contend with the poor distribution of legal protection that masses of people have long been globally confronted with. I’m pointing no fingers horizontally; there are difficulties in expressing this clearly and carefully: I see the current fraught climate as a grave and urgently dangerous opportunity for us to join our story to those with whom it has always rightly belonged. It is a moment for parents of the abducted and many others besides, in countless social “categories”, to come to a new sense of awareness of zones of precarity, but also zones of privilege from which shock sometimes speaks. A small but growing group among the parents have worked hard, very hard, for access to the ears of members of government agencies. Their aim is to raise the engagement of state powers to act to bring abducted children home, and to prevent further abductions from becoming the faits accomplis that ours perennially do in America’s “friendly” state partners, such as Japan, and around the world. They have failed for a long, torturous time. Perhaps some part of the difficulty lies in the choice of alliances, and the hope that the zones of privilege will smile on them. I now see a dramatic illustration has arisen of the need to seek to share the cause of children’s security with others whose fears and pain mirror ours. Here we have an emergency generated entirely from within the United States without the assistance of Japanese or other national systems of civil courts. It’s no longer possible for the U.S. Department of State and other agencies of the government of the United States to stand behind the child-abusive elements from abroad it ordinarily shares or divides processes with, or cedes management and control to, in order to smooth the conflicts with which it would wish otherwise not to be faced. It’s time for all of us who care and are related to our own abducted families to recognize that we share this fate with a wider variety of the expelled than we have previously done. Official permission granted by the U.S. Department of State to stand aside and facilitate as our children are kidnapped and abused in Japan is consistent with the American practices now under scrutiny, wherein the interests of children are given lip service in the law, and tossed in the dustbin the moment officials are out of earshot or the public eye. We the LBPs must demand: detention of migrant families and children has to end. Our organizations, small and inconsequential as they are, can join in efforts at any and every level, and we are ethically enjoined to do so. Write letters, collect signatures, invite our families and friends to join with the oppressed, march in the street, and make the inactive, inert, and guilty here in the United States hurt. Next post: Reports are now out that children held in border Concentration Camp detention are being drugged by medical personnel. 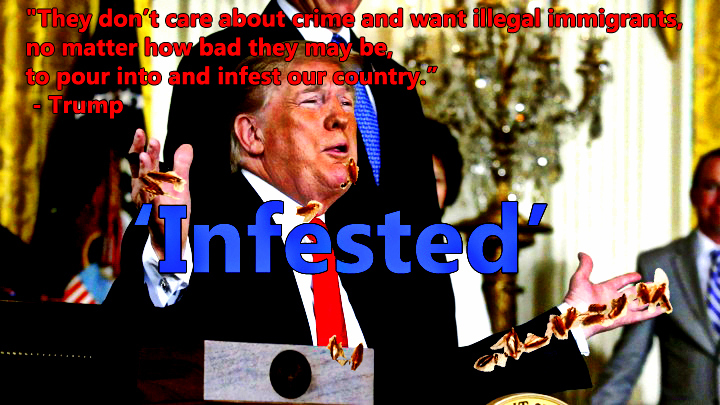 U.S. President Donald Trump – used the Nazi language of disease and filth this week to claim that immigrants are “infesting” the United States.